Erjia, who was only a couple of years older than Sheng ’s oldest son, called Sheng “Shuren Dage” (树人大哥) or Big Brother Shuren, and Sheng Shuren called Erjia “Jia Di” (“家弟”) or Little Brother Jia. Shuren Dage and Jia Di did not cook and ate in a neighborhood canteen mainly for the neighborhood factory workers. There, Erjia’s two favorite items, steamed dumpling and pickled duck egg, sold for 5 cents a piece. Going Dutch, the two men lived on twenty yuan a month. Sheng Shuren’s mother was sick, and the two men often went to a general store together to rent oxygen bags for her (she died not too long after Erjia left). 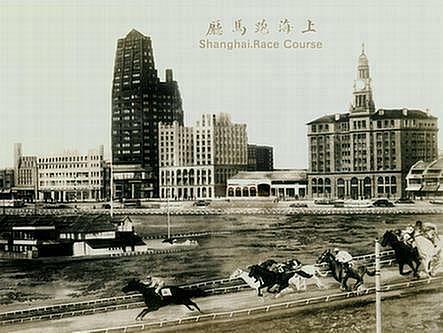 When there was nothing better to do, the two roamed Shanghai’s streets and down the east bank of the Huangpu River. Sheng Shuren suffered from nerve compression syndrome, walked slowly and had to stop often to rest. The two liked to sit in the People’s Square. After so many years, Erjia has forgotten the name of the square but remembered that Shuren Dage told him it used to be the race course of Shanghai. I found out the name following this clue. Shuren Dage told Jia Di that someone offered one thousand yuan to buy his St. John’s University diploma, but it could be sold for at least two thousand yuan in Hong Kong. He mentioned that he had been suspected of being a spy. He said there were a lot of errors in Xinhua’s English broadcast (apparently he listened to it), he wrote them down, corrected them and sent his corrections to Xinhua. Erjia looked at Shuren Dage in disbelief: Why are you doing that? They wronged you! Besides, they don’t care about your corrections! After settling down in Shuren Dage’s house, Erjia went to visit a friend of his own eldest brother from his army years. The friend violently objected to Erjia’s staying with Sheng Shuren. “You can’t have contact with someone like him!” He shrieked. Erjia was taken aback: Isn’t he the same as my brother Erning? “No!” the friend shouted. “He is not the same as you and your brother!” Erjia found such discrimination arbitrary and unreasonable, and, forty years later, he described his reaction at the time as being “shocked.” Rather than staying with his brother’s friend as the latter insisted, Erjia returned to Shuren Dage. Sheng Shuren taught English privately. When Erjia was there, he had three students, three young but grown men whose identities were unclear to Erjia and whose classes alternated, each lasting one and half hours. Sheng also taught at students’ homes. Sometimes when the two were outside, Shuren Dage would ask Jia Di to wait wherever they were for him for an hour and a half, and they would continue when he returned. Shuren Dage told Jia Di that, if Erjia stayed in Shanghai for two years, he would have taught him English. To this proposition, Erjia giggled and shook his head: something as foreign as English is not for me. I told Erjia that, Sheng Shuren started teaching English soon after his return from Xushui, and at least one of his students came from as far as Wuxi, more than a hundred miles away. On the web I found one Mr. Qian on a local listing who wrote that, after graduating from high school in 1962, “I studied English from Mr. Sheng Shuren, a graduate of St. John’s University, following my father’s instructions.” Erjia marveled how great Sheng Shuren’s English was. Always embarrassed when people who don’t know English effuse praise over others’ ability of English, I hurried to supply Erjia the evidence: St. John’s University was an all-English university, and Mr. Sheng had worked for the two best English publications, and also for the British mission, in Shanghai. Erjia said Sheng Shuren was talkative, but when I asked about their conversations during those two months, he couldn’t remember anymore. Was he a “rightist” (victims of the Anti-Rightist Campaign in 1957)? I asked Erjia. Erjia thought about it and said, No, never heard of him, or Erning, mentioning it. Did he talk about what had happened in Xushui? This time Erjia did not hesitate: No, never. He didn’t mention it, and I didn’t ask. Besides, Erjia added, it was such a shameful thing, and who would want to talk about it? A trip to Shanghai was a big deal, if not a once-in-a-lifetime event; Erjia had a long list of things to acquire for family and friends, good stuff that only Shanghai had to offer as well as things hard to get hold of in Liaoning. At the time, to buy a bicycle you had to have a government-issued voucher, and the vouchers were hard to come by without back-door connections. In Shanghai, though, where bicycles were made, vouchers were sold 15 yuan a piece on the black market, in the basement of the Municipal First Department Store where deals were made with furtive eye contact and hand gestures. Erjia bought one, and with it, bought a bicycle in Shanghai that was still cheaper than in Anshan, shipping included. The two of them went to buy shoes, Shuren Dage changed on the spot into the new shoes he had just bought for himself, leaving Erjia the bewildered impression that the Shanghainese were a very “different” kind of people. As Erjia’s departure approached, the two men went to the grocery store one morning to purchase cutlass fish. Limited to one kilo per unique purchase but not by the number of purchases, they got in line repeatedly to buy enough to salt-preserve them. 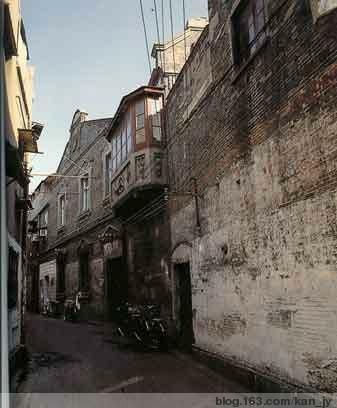 When Erjia left Shanghai, he carried no less than eleven luggage bags, large and small, the content including a pot of lard, a bag of flour, a Triple-Five wall clock, five kilos of preserved cutlass fish, three bags of clothes and shoes, two bags of Big White Rabbit soft candies, and more. Plus the bicycle. Shuren Dage prepared two gift boxes of Shanghai traditional pastries from the City God Temple market for Erjia to take home; for his friend Erning, he brought two tins of tea leaves. On the day when Erjia left, Shuren Dage saw him off on the dock and told him to come back to visit again. It took a long time to board the ship and for it to leave, and Shuren Dage stood on the dock until the ship set sail before walking away slowly. It was either in 1976 or 1977, Erjia received a letter from Sheng Shuren’s wife, telling him that he had died in a car accident. With that letter in his hand, Erjia teared up for days on end. 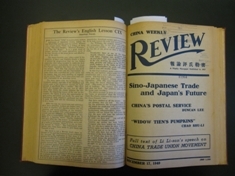 China Weekly Review, collection of the library of Congress. In its first issue after the liberation of Shanghai in May 1949, the journal stated that “we therefore welcome the change that has come about and hope that the arrival of the People’s Liberation Army will mark the beginning of a new era—an era in which the people of China can now begin to enjoy the benefits of good government” and that the magazine “will endeavor to reflect honestly and fairly the development of the new China, especially the concept of democracy of the Chinese communist party.” In 1952, the journal published the diary of Rewi Alley, the New Zealand writer and educator, in which he enthused that Beijing was a “city of hope” and “a paradise for the young men and women growing up in the new era.” Finally, when the magazine folded in 1953 and its editor John W. Powell returned to the US, the US government charged him, his wife and another editor for printing false statements about the United States military using germ weapons against Chinese troops in North Korea. The trial was declared a mistrial by the judge and the subsequent attempt by the government to bring charges of treason against them was unsuccessful because it failed to obtain indictments. Later, with the approval of Attorney General Robert F. Kennedy, the remaining sedition charges against the three were dropped. In the communist partyspeak, “progressive” means pro-communist, and one—anyone—is either an enemy or a friend of the party. By this yardstick, The China Weekly Review was clearly progressive and definitely a friend. About its cessation, the sources I read said unanimously that it was due to financial difficulties caused by the American embargo. That might or might not be, but every Chinese, even a child, knew that, the journal—or any publication not directly controlled by the Party—could no longer exist, with or without financial woes. As his case was dropped in the US in 1961, Powell probably did not know that, the Chinese journalists he knew or worked with, including a young man once employed by his magazine by the name Sheng Shuren, had mostly been struck down, during a succession of purges, as “reactionary,” “anti-socialist,” “rightist,” “right-leaning element,” “spy,” “anti-communist party element,” “anti-revolutionary,” “class enemy,” or “traitor,” and none had the right to defend him/herself, let alone to have a fair trial. If a few lucky ones were spared in the 1950s, they would have been rounded up, without exception, a few years later in mid 1960s when the Great Proletarian Cultural Revolution began. By T in Uncategorized on June 26, 2012 . I’m finding this to be some rather interesting reading, Yaxue. These are the types of small stories that weave together to form a larger, more cohesive picture of the times. Thanks!